Underhill Precision “Specific Task” Nozzles with solid metal construction, deliver millions of soft uniform water droplets providing a rapid, yet gentle water application over a wide range of flow rates. 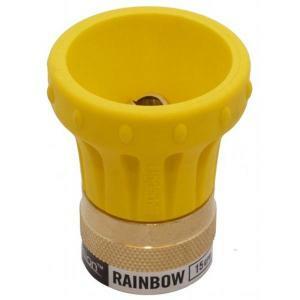 The Yellow Precision Rainbow nozzle provides 15 GPM for use with any delicate landscape areas, seedbeds, or transplants. Also great for golf course greens and tee areas. The Rainbow Precision nozzle is designed to fully irrigate without disturbing turf, dirt, seeds, etc…, providing a precise solution for hand watering applications.